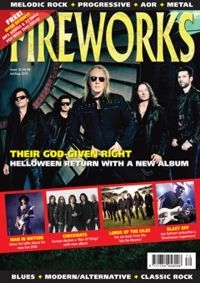 The new issue of Fireworks sees the German Metal legends Helloween explain their 'God Given Right' while guitar enthusiasts will be eager to hear what Steve Vai, Joe Satriani and Bubmblefoot have to say about their latest projects. Europe are back with a brand new record, just like British rockers Ten, who deliver a new album just six months after their last one! Ex-Alcatrazz vocalist Graham Bonnet speaks about going back into the studio, while another Rainbow vocalist Joe Lynn Turner discusses the Rewind Festival, Rated X and the talk of him reuniting with Ritchie Blackmore. With the likes of House Of Lords, Kamelot and Symphony X rounding out the 22 interviews this issue, there's plenty to get your teeth into! 22 interviews in total & much more! Not only that, we have the usual huge cross section of reviews covering Classic Rock, Metal, Progressive, Symphonics, Blues and AOR - is there a more in depth reviews section in any other magazine? We don't think so... nor are we aware of any magazine giving away 71 (yes, SEVENTY ONE) songs with the issue, ABSOLUTELY FREE. We guarantee you'll like something on the disk. If you don't, we can only assume you have bought the wrong magazine, or you are Simon Cowell.